ACA Travel & Tours Inc. and AMADEUS have teamed up to offer you a great tool that will help you increase your sales as well as your profits. As you may know, ACA Travel is recognize as one of the top wholesalers in the industry, specializing in Mexico, Central and South America. Throughout many years we have established a lucrative relationship with all of our business partners, these include many of the top U.S and Latin Airlines, Tour Operators, Resorts and Hotels to mention a few. Now through this program you can be a part of our team too. We would order an extra office ID for your AMADEUS CRS. This office ID would give you complete access to our net prices, also our commissionable fares that we have under contracts with all of our Airline partners. This would give you the control to book at anytime, anywhere; were talking real time bookings! Also, you would have control of your own reservations and have the freedom to mark up your profits as you wish and issue your tickets right from your system.  You must be familiar with Amadeus functionalities.  There will be a 300.00 non refundable start up fee..
 We will charge 3% from the base fare of every ticket you sell. Or reservation you make for cars, hotels and train. You will be responsible to deposit or send payment in accordance to your sales. 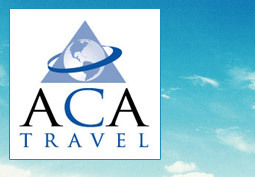 ACA Travel and Tours Inc. does not require any contracts for this program. You may cancel at anytime. If you are interested in this, please contact LUIS ARENADO via email at sales@acatravel.com, or fill out our form below, and we will be in contact with you.